A small 'Dame School' is believed to have been held in the building adjacent to the Red Lion on Windsor Street, This may have been Mary Foxon's Day School (1849). This building was originally a childrens home; plans were submitted for a building in the 1860's, however it was not built until 1912. Children may have been educated here, although older residents remember children in grey uniforms walking down to the Wesleyan School, c1920, they were free to play out with the village children after school. A Mrs Johnson wife of the local carpenter was Matron here, one of the first women to ride around the village on a motorbike. By the 1930's the Wightman family had purchased the building and one resident remembers a long corridor with rooms leading off and rows of small coat pegs on the walls. The building is now two private houses. The Wesleyan Day School, Windsor Street, opened in 1849. It was endowed with £30 pear year left by Reverend Benjamin Hurst. It was built originally as an alternative place of education to that of Church of England based National Schools. A small building adjacent to the Wesleyan Church (1866) originally single storey later enlarged by the addition of a second storey to accommodate 255 children. John Reeves was established as Headmaster by 1861 and Miss Caroline Cowles as Mistress in 1877. William Collyer Brittain became Head in 1889. In c1902 Leicestershire County Council converted the Wesleyan into a County Council School. Mr Brittain stayed as Head until the Grove Road School opened in 1927 when the Wesleyan closed, the remaining staff moved to Grove Road and the old National School. The earliest recorded school was started in 1825 in the building next to Archer Cottage, near the church gates, by an endowment of the Countess De Grey. In 1846 John Lowris became Headmaster and by 1849 it is described as a 'free school' with 60 boys and 50 girls attending. The head was assisted by Catherine Mcgennis. In 1861 a Daniel Gilbert is school head. By the 1870's the population of Burbage had grown to 1725, the Dowager Countess Cowper contributed liberally to the building of a new school on a site next to the church on land donated by the Rector. The foundation stone was laid on 9th May 1871 by the Rector Willoughby William Townley Balfour, Daniel Gilbert continued as Head assisted by Mrs Gilbert. The school attendance is recorded as 66 boys & girls in 1877, with William Taylorson School Master and Miss Martha Elizabeth Lowris school Mistress. The school was eventually enlarged to accommodate the growing population. In June 1897 diphtheria was endemic in the village and the school was closed and thoroughly cleaned. By 1912 the average attendance 184 boys & girls and 100 infants, with Charles Higham as Head and Miss Mary Withy infants Mistress. In 1927 Grove Road School opened and only the younger members of the school remained. 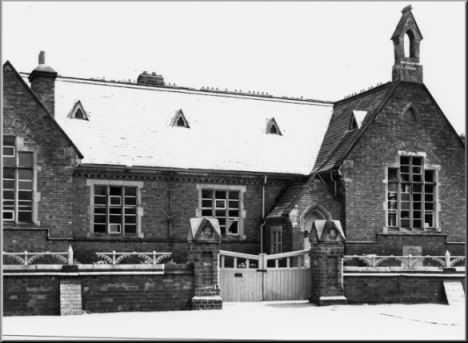 In the late 1960's Grove Road Junior School was built, however it was found to be too small and some classes were still held in the building until the 1970's, ceasing to be a school 100 years after it opened. Hastings High School was opened to pupils in September 1956 as part of the governments post war plans for secondary education. The school was purpose built with laboratories, practical areas for metal & wood work and domestic science, a well equipped library, gymnasium and chapel. It was set in spacious playing fields with tennis courts and an amphitheatre for outdoor drama productions. The old Far Lash Farm was demolished and the surrounding land used to build the school on the highest point in the village. Hastings High School was named after the 'Hastings' family, who came over with William the Conqueror in 1066 and were allotted substantial areas of land in Leicestershire. The school was officially opened in June 1957 by Dr Glyn Daniel, a TV personality, with celebrations and entertainment by the pupils. 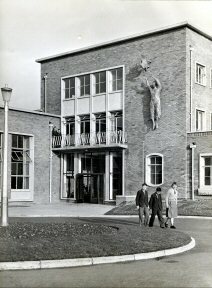 Over the main entrance to the school there was a large sculpture by Ben Franklin RBA, which symbolised the spirit of man released by education. This was purchased by Mrs F Simmonds in memory of her husband Alderman R Simmonds who originally instigated the building of the school. The first headmaster was George Baxter a World War II hero who commanded great respect amongst the pupils for the 23 years he remained at the school. The school originally took pupils up to the age of 15, now it has over 500 pupils who attend for 3 years up to the age of 14 when they leave to join other Hinckley high school pupils a John Cleveland College. The school has produced many distinguished pupils and has been listed in the Independent Newspapers top 250 schools in the UK. The school has celebrated its 25th, 40th and 50th anniversaries. By the mid 1960's the population of Burbage was increasing rapidly, a large council estate had been built plus a number of owner occupied estates with family size homes. The Old National School was deteriorating and Grove Road was to small to accommodate increasing numbers. The Leicestershire County Council decided to build a school to accommodate the older children and land on the opposite side of Grove Road was purchased. Building started in September 1966 and the school was opened in January 1968. Mr Raymond was appointed caretaker for the new school on the retirement of Mr Hampson in March 1968. It was found however that the new school could still not accommodate the increase in population and Mrs S Sharpe remembers two classes of seven year olds had to move back to the Old National School until classrooms had been built, this arrangement lasted until c1970. The school built up a good reputation for academic excellence especially in the arts. It also had a strong Parent Teacher Association. During the summer holidays of 1975 a parent/teacher volunteer working party prepared the site and dug out foundations for a permanent covered swimming pool, (erected 8th September). The pool was in continuous use even in the school holidays. There had been a playgroup for a number of years at Higham Way, but nothing in the centre of Burbage when Mollie Orton started the playgroup at the Congregational Church on Church Street, Burbage. Fifteen children attended the first session, then it rose to twenty four and now averages thirty two a session, with eight sessions per week, rising to ten next term. Mollie has faithfully kept a recorded of every child and event over the years, which she has kindly lent for this exhibition. Children start at the age of 2½ years and can stay until school admission at the age of 4/5. The pupils are given a nursery education, the foundation state (National Curriculum), they successfully pass the OFSTED and Social Services inspections. Most summers the group has a garden fete at Stretton Firs, Wolvey and regularly take part in the Burbage Carnival with a float full of children. Over 1000 children have attended the group and many former pupils recall happy days attending the school. Mollie follows former pupils with great interest and is now teaching the second generation of pre-school infants. Five years after Grove Road Junior School was built it was decided that another school was needed in Burbage. Sketchley Hill School opened in September 1973 under the headship of Mrs Pat Hyland. The building was a purpose built open-plan County Primary School, with class areas, two assembly halls, kitchen, studio (for music, etc), offices and other usual facilities. Children from Sketchley Manor, Three Pots and surrounding estates could choose to attend. Wide ranges of extra curricula activities were encouraged including an activity chess and drama club. Children were organised into mixed ability groups according to their age. The youngest member of the Burbage 'family' of schools is the Menphys Centre in the grounds of Sketchley Hill School. A purpose built centre for children with any degree of handicap from the age of six months to pre-school age, children travel to the centre from surrounding areas. Menphys is a charitable trust and £650,000 was raised to build the centre and £200,000 to equip it. The Leicestershire County Council and Area Health Authority help finance the running costs. Some of the special features are a multi-sensory room and soft play area. Older children from Sketchley Hill School can volunteer to help in their break-time's to play with and help feed the pupils.